On Tuesday, December 20th, Disney will release its sixth wave of Star Wars Tsum Tsum plushes! This release will be based on Episode V: Empire Strikes Back, and includes characters from the film’s massive battle on the ice planet Hoth. The Star Wars Hoth Tsum Tsum Collection includes stackably soft plush figures of Princess Leia in Hoth Gear, General Veers, K-3PO, AT-AT Driver, 2-1B, and Snowtrooper. All six of these awesome Star Wars Tsum Tsum plushes will be available in the popular 3.5” mini size at DisneyStore.com and Disney Store retail locations for $5.95. But that’s not all! Disney is also releasing this epic Star Wars Taun Taun Tsum Tsum Collection! 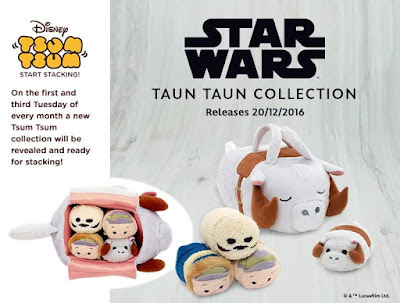 It features a giant Taun Taun Tsum Tsum 9.5” Plush Tote, which opens up from its belly (just like in that iconic ESB scene) to reveal four 3.5” mini Tsum Tsum plushes of Han Solo in Hoth Gear, Luke Skywalker in Hoth Gear, a Taun Taun and a Wampa. How awesome is that!?! This is a must get for The Blot for sure. Look for this very first Star Wars Tsum Tsum Plush Set to retail for around $34.95.